How to deal with severe climatic constraints such as humidity, frost, running water, thermal shocks and direct sunlight? Type: Private or hotel terraces, balconies, passageways and similar. • Allow for a minimum slope of 1.5 % (1.5 cm/m) to enable the run-off of rain water. • Avoid tiles that are too dark or those likely to be slippery when wet. • Use a High Performance adhesive mortar at least.• Allow for surface control joints every 6 linear metres*. SUITABLE SUBSTRATES: Compliant with the NF DTU 52.2. • Concrete slabs on an earth platform, bonded cement mortar screeds. • Solid concrete slab flooring. The substrate should be sound, resistant, dust-free, clean and dry. • That cement slabs and screeds have been allowed to dry for at least 1 month (2 months for flooring). That there is no shrinkage in the cement. • That the surface is clean: thoroughly clean off any soiling and cement laitance using CERMINET cleaner and wash with a high pressure water jet, then allow to dry for 24 h. Sand down any traces of oil or grease until clean cement is reached, then remove dust. Frost proof tiles and paving made of pressed or extruded stoneware, ceramic stone in formats from 100 to 2200 cm2 (natural stone up to 3600 cm2). • Thicknesses up to 10 mm: use the appropriate adhesive mortar the day before fixing the tiles. 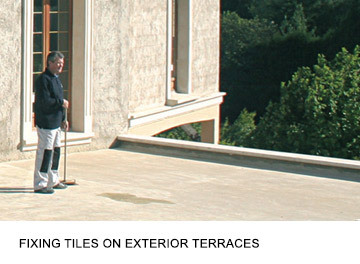 • Localised reworked areas of 1-2 m2: the tiles may be bonded the next day. Water proofing is strongly recommended in private terraces in non closed off areas or on garages, balconies and passageways: use CERMIPROOF two component cement based under tile liquid damp proof protection system (SEL), which is highly elastic, combined with AT 75 reinforcement strip, which protects against water infiltration and damage. * The following are not covered by the present document: waterproofing of roofs, terraces and buildings since these come under specific techniques. • Use a C2 class adhesive mortar. • Only work under favourable conditions (temperature between 5 and 35°C) and sheltered from bad weather. • Fix the tiles without primer with a 9 x 9 x 9, 8 x10 x 20 or half moon 20 notched trowel. • Always use double spreading, i.e. spreading a thin layer of adhesive on the back of the tile as well as applying it to the substrate, then firmly press the tiles down until the lines of adhesive are completely squashed. This technique makes it possible to avoid the stagnation or circulation of water at the tile/substrate interface and contributes to rendering the work frost proof . • Allow for inter-tile joints of at least 5-6 mm width and allow for an abutment peripheral joint of at least 5 mm . • Do the jointing 24 h after fixing the tiles with CERMIJOINT TX, CERMIJOINT SOUPLE or CERMIJOINT RUSTIC. • Allow for substrate joints. Protect the work area from bad weather while working and for 48 hours after jointing. NB: Check the nosing is properly in place: there should be no adhesive on the underside vertical return; use a water run-off profile.